Saturday, February 12, 2011 was the 30th running of the El Camino Real Derby, a 1 1/8-mile grade 3 horse race for three-year-old thoroughbreds. 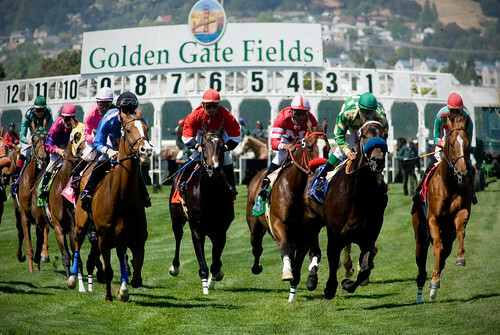 This race has been held at scenic Golden Gate Fields in Berkeley for the past three years, but it originated at historic Bay Meadows in San Mateo, just off El Camino Real. Bay Meadows closed for racing in 2008. This was Silver Medallion’s second and biggest win, earning $120,000 out of the total $200,000 purse for owner Michael J. Ryan. His trainer is Steve Asmussen. His jockey, though, is no stranger to the El Camino Real Derby winner’s circle. 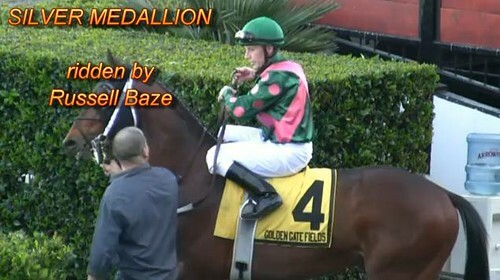 Saturday he was ridden by the great Russell Baze, who has won this event eight times, more than any other rider by far. He is in fact the winningest jockey in North American history11,000 victories and countingand an inductee in the National Museum of Racing Hall of Fame. The El Camino Real Derby is aptly named after the Royal Road because the derby is on the path to the coveted Triple Crown of Thoroughbred Racing. Past El Camino winners have gone on to win one Kentucky Derby, five Preakness Stakes, and one Belmont Stakes. Silver Medallion is off to a great start. Let’s see if he can continue to bring in the gold. The Thanksgiving holiday weekend always fills me with some anxiety and dread. It’s not Thanksgiving that bothers me; I love Thanksgiving Day and the time spent with family and turkey and friends and pie and strangers and stuffing. It’s the incessant pressure to shop ’til I drop immediately after that stresses me out. I don’t begrudge our intrepid retailers the opportunity to sell me a good or service. I only resent the insistence that it happen right now. A lot of it is my own inferiority complex. I’m a chronic procrastinator. (I intended to write this post last week.) I have been known to gleefully and frantically do the bulk of my holiday gift shopping on Christmas Eve. So when I start seeing the ominous Black Friday notices in early November, it makes me feel bad that Halloween came and went and I didn’t even start making my lists and benchmarking pre-discount prices. Black Friday to me is all about preparation, and the day after Thanksgiving I am never prepared. If Black Friday shopping is your thing, get out there and get your grind on. The universe of shops on El Camino Real is waiting for you. My father-in-law Harold often visits us from New Jersey for Thanksgiving and for many years he and my wife Paulette had a Black Friday tradition of heading out to Learning Express on El Camino in Sunnyvale to take care of the high-priority kids’ gifts. Sadly that store has closed and those same kids now have grown more interested in Game Stop and American Eagle. Retail on El Camino is anchored by its regional malls. Great Mall in Milpitas opened at midnight Friday morning, luring shoppers with discounts up to 60% and a scratch-and-win gift card lottery. Stanford Shopping Center opened at 8:00AM and gave goodie bags of holiday loot to the first 250 shoppers to join their email list. The Shops at Tanforan in San Bruno opened at 6:00AM. 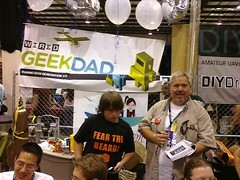 They also have goodie bagsone lucky one of which is worth $500and you’ll get a $15 gift card if you spend $150. Oddly Hillsdale Shopping Center in San Mateo shows remarkable restraint. They don’t tweet, they don’t Facebook, and there’s precious little mention of Black Friday at all on their website. That’s just their style I guess. There’s a whole lot of shopping to be done in the spaces between the malls. Every national chain store on El Camino, big box and otherwise, is vying for your business. There are too many to name. My email inbox is bursting with offers. Just swing a dead cat and you’ll save some money. Dead cats are 50% off at Necro-pet-a-porium today only, by the way, if you mention this ad. Enjoy your shopping season, and may your discounts be deep. Just save some good merchandise for me. I’ll be out looking for it on my own Red Friday…December 24, 2010. The start of the Fall holiday season is definitely upon us. There are several events coming up to kick it off. Don’t forget to check out the El Camino Calendars page for a list of venues which always have a variety of activities going on. Join us for a special Autumn Open House and experience Plant 51’s vibrant and growing community for yourself. 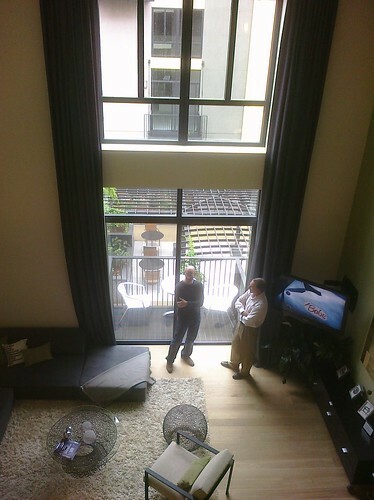 There’ll be seasonal food and refreshments, along with tours of our Building C collection of lofts and flats. This is a great time to buy. Rates are low and you can be all moved in by the holidays. Shop over 200 booths of American handmade, original art, crafts, ceramic, jewelry, blown glass, pottery, specialty foods and 24,000 other items during this three day Festival. Enjoy all day stage entertainment at the large stage, comedy juggling at its best, along with stilt walkers, funny horsemen and the Mama Claus Duo. Peninsula Youth Ballet and several of our exhibitors will be doing special features on the small stage. Avenue Art in San Mateo will be celebrating its one-year anniversary in November. Twenty-six local artists, spanning a variety of different genres  from paintings, sculpture, and glassware to fine photographs, jewelry, and other wearable art  are now displaying their creations for sale at the gallery at 60 E. Third Ave. An official celebration will take place 6 p.m.-9 p.m., Nov. 13. Everyones invited. Santa will be taking requests at Great Mall on Saturday, November 13, 2010 at 1:00 p.m.
Theres nothing like the annual visit to Santa for creating family holiday memories that will last a lifetime. Bring the kids and their lists to Great Mall for one of the most magical and enduring holiday traditions. I’m still trying to catch my breath from the crazy start to this week. Halloween! Giants! Election! Oh my! 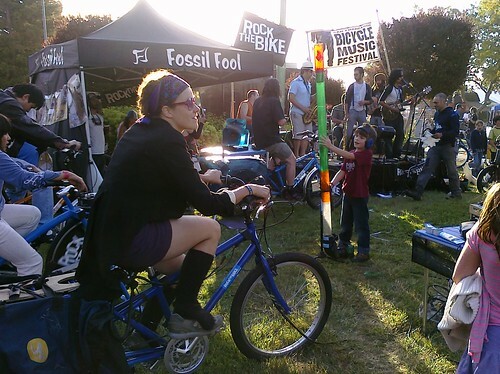 Take it down a notch and relax at some of these upcoming El Camino events this weekend. As always, be sure to check out the El Camino Calendars page for a list of venues which always have a variety of activities going on. Tragically somehow I accidentally deleted my “El Scare-Mino Skull-endar” posting from last week, which listed a bunch of Halloween events. C’est la vie. 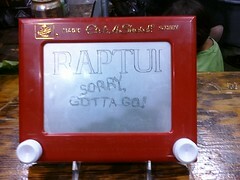 In the future I’ll be more careful. JOIN US for the next South FIRST FRIDAYS art walk on NOV 5th! 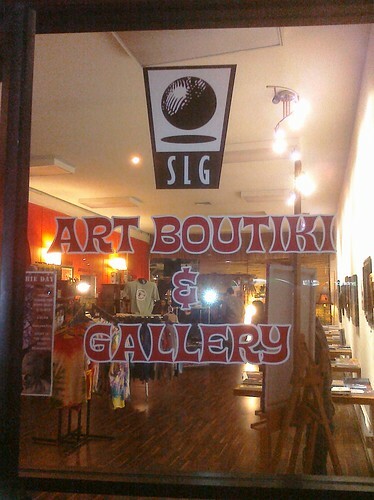 The SLG Art Boutiki and Gallery, home of Club Tiki Press publishers of the famed Beachbum Berry Tiki Drink books, celebrates November with a Tiki art show celebrating, well, tiki’s and our love for them. Live music and all of the normal South First Friday Art Boutiki good times. Hang with friends (and meet new ones) at ArtRage. Do some in-person social networking! Admission $5. Local neo-soul/funk/hip hop favorites “So Timeless” will get you moving. Join Meals on Wheels organizations from seven Bay Area counties and fabulous partner restaurants throughout your community for the first annual Bay Area Dine Out for Meals on Wheels on November 9, 2010. Combined, these Meals on Wheels organizations provide nearly 3 million meals each year to over 8,500 local seniors in our communities in need of a hot, nutritious meal and companionship each day. Meet Bobbi Brown, the world’s most celebrated makeup artist and bestselling author. 5:00 p.m.  8:00 p.m.
Give her 5 minutes. She’ll show you how to break some rules. Come meet Bobbi Brown, who will be at the Stanford Bookstore to sign her new book, Beauty Rules. Celebrating 77 years serving our community. Children will compete and perform for a chance to win mall gift cards. First place will receive a $150 mall gift card! Come and support these talented rising stars! To participate in the talent show, visit the mall management office or call 650 392 1631 to request an application. The application deadline is November 4th. Get your hands on the hottest games and more. Be the first of your friends to play some of the most talked about unreleased games. Last November I took a bus ride up El Camino Real from San Jose to San Francisco and blogged my impressions and observations. To avoid giving myself whiplash, that day I only looked out the right side of the bus at the eastern side of the street and doggedly ignored the left side so the job was only half done. 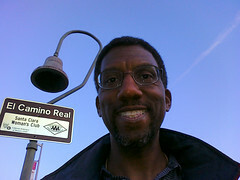 Last Friday, September 3, 2010, I completed the task, taking the reverse bus trip from San Francisco down to San Jose, observing the west side. Back in November I scribbled all my notes on the bus by hand in a notebook and ended up taking four months to type them all up. It’s not that I’m a slow typist, it’s just that the scope of the project was much larger than I anticipated. For the second trip I found a more efficient way: I live-tweeted my journey. If you’re unfamiliar with tweeting, it means I used my cell phone on the road to type and send text messages to the Twitter service. Twitter messages, or “tweets,” are limited to 140 characters each so it enforces brevity. A great advantage is that every message was timestamped and geocoded by GPS so I have a complete record of what I saw, when I saw it, and where I was. I tried to live in the moment and just write what was on my mind which means whatever happened to catch my eye out the bus window. I know it’s a pretty pedestrian read (irony intended) but I hope I conveyed a sense of El Camino’s diverse profile. Below are my 167 tweets from that day from my brand new @allcamino twitter account. It took some effort to extract them all from Twitter’s web site. There are web apps that do this but they didn’t work for me because they rely on Twitter’s search engine which failed me, returning only six tweets (?!). I wrote a Perl script to convert their HTML to the format I wanted for the blog. To improve the readability I put each time stamp and location stamp against the right margin above each tweet. You can click the location links to open a Google map. My live-tweeting strategy worked great. Last year it took me four months to finish the writeup. Here I’ve done it in less than four days. The Palo Alto Caltrain station was the county-nental divide for my transit trip up El Camino Real. It’s where I left the VTA system which serves Santa Clara County, and boarded the SamTrans Route 390 bus which serves San Mateo County. I had a few minutes to wait so I spent them studying the posted maps and schedules. That’s when I spotted a notice that was as welcome as it was unexpected: select VTA and SamTrans routes accept each others’ day passes in Palo Alto. I could use my VTA pass to board the SamTrans 390! For free! Sweet! Fare: $0.00 w/VTA day pass! The 390 arrived after a few short minutes. It was an impressive articulated coach. I boarded and flashed my VTA pass with just a hint of nervousness that it would be rejected, but my papers were indeed in order so I had no problem at all. The train station is the startpoint for this route so the bus was empty. I had my choice of seats and selected one on the right side as I planned, stowed my backpack at my feet, and settled in for the long ride up the Peninsula. 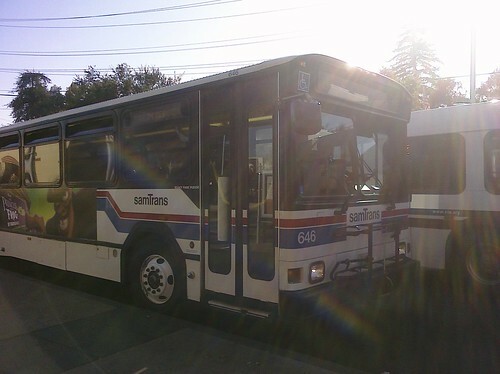 I’ve lived in Santa Clara county for a while now and I like to think I brim with civic pride, but I have to say honestly that the SamTrans 390 was nice. Really nice. Frankly it blew the VTA 522 off the road, which pains me to admit. The windows were clear (no wrap! ), the seats were comfy, and the air conditioning was luxurious. Best of all its general pace was much more leisurely. As we pulled out of the station past the historical marker at MacArthur Park and turned onto El Camino, I could literally feel myself relax as I sat back and prepared to enjoy the ride. I hate to bag on VTA but I’ve always been ambivalent towards it. 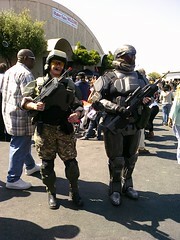 There was a period when I took it every day to work and regularly took it to special events downtown. It’s an adequate system, but I wish I could say it’s great. The fact is it’s troubled with low ridership, high fares, and increasingly infrequent schedules. Part of the problem is that the county, especially San Jose, is so gosh-darned spread out with relatively little population concentration that it’s tough to service it efficiently. Plus in our history we’ve been blessed with some boom times, most recently around the high tech industry, that resulted in a solid suburban middle class and drove the adoption of a car culture. So our buses are not world-class. I do have hope for the future of VTA given new high-density development around transit hubs and the plans I’ve seen for dedicated-lane Bus Rapid Transit, but we’re not there yet. Back to SamTrans, I noted with approval the aptly named El Camino Park as we drove by, then tried and failed to spot El Palo Alto the landmark tree as we crossed San Francisquito Creek; I think it’s just not visible from El Camino. And then just that quickly we left Palo Alto, left Santa Clara County, crossed into San Mateo County, entering Menlo Park. The Tesla Motors dealership is a hopeful spark in contrast to the three or four closed car dealerships just up the street. There are still plenty of gas stations though, additional reminders of El Camino’s car-serving nature. Jeffrey’s Hamburgers stands out as an eye-catching diner; I’ll have to check it out soon but it will be competing with some of my favorite burger joints past and present on El Camino. At Ravenswood I saw the first historical bell of the county and it was a standout because it’s the first I’ve seen that isn’t hanging from a trademark shepherd’s crook guidepost. Rather it’s hanging on a yoke which I presume is how they were mounted in the actual missions. I took pictures of this bell, and these were pretty much the only photos I managed to take out the bus windows all day. The only reason I got these is that I lucked out and the bus was stopped at a lengthy red light. I had planned to take many more, but I was overwhelmed simply trying to look vigilantly out the windows without missing anything. It was hard enough just taking notes; photos were beyond me. The light finally turned green and I was treated to the ultra-hip Menlo Center and the sublime Kepler’s Books. I noted a historical marker at Triangle Redwood Grove, and that Gaylord Indian Restaurant had closed. Gaylord at the Stanford Shopping Center used to be a favorite with my family and my college roommate. I still miss it. Atherton is wide but short so before I knew it we rolled into Redwood City. I jotted something about “SF Water Dept.” but have no idea what that was a reference to. I may have become distracted because around this time the air conditioning on the bus shut off and the heat snapped on, throwing me for a loop. We passed the Target at Charter Street then the SR 84 junction, our first highway crossing in quite a while. Harry’s Hofbrau made me nostalgic with its old-timey decor. There’s an El Camino bell posted nearby at Chestnut Street, welcoming you to town. Franklin Street Apartments provide some residential density convenient to the shops and transit at bustling Sequoia Station, but Maguire Correctional Facility looms soberly behind it. A quick look down Broadway reveals a classic and historic downtown (“Climate Best by Government Test”). The Ben Frank’s hot dog stand is as iconic and appetizing as ever, but it overlooks the too-close at-grade Caltrain crossing which was the scene of a shocking tragedy last year. I chuckled at the odd alternating type sizes on an “EL CAMINO REAL” street sign, then noted with satisfaction that the Caltrain tracks are at a higher, safer grade by the time it crosses over Howard Ave. This stretch has some big culverts which are cool to look at. Somewhere along the line I noticed a couple free newspaper boxes for the Daily Post and Daily News. As we cruised into San Carlos I stuck dogmatically to my strategy of only observing the right side of the street. That’s when I discovered that in San Carlos, there is no right side of the street, just gravel lots and train tracks. The Caltrain tracks are so close to the road there’s no room for proper businesses so most of it is left open. The businesses that should be there seem to be on the other side of the tracks, on Old County Road. The San Carlos Caltrain depot at San Carlos Avenue however is an eye-catching exception, and is graced with a bell. Things open up shortly and there’s a posted notice for proposed development north of the station, which is a recurrent theme. San Carlos Plaza, a shopping center, leaves no doubt that the right side of El Camino is indeed open for business. Trivia break: this paragraph contains the name “San Carlos” seven times. San Carlos. Belmont is frankly more of the same. There’s a bell near Harbor Blvd. and another at the Belmont Caltrain station at Ralston Ave. By then the right side narrows to a gravel lot again. Then something surprising happens: El Camino must gain a little elevation because the sight lines clear and you gain an expansive view of the San Mateo Bridge and the East Bay hills. Google Street View tells me this occurs around Marine View Street and Mountain View Avenue. Someone was paying attention when they named those streets. Now entering San Mateo, the county namesake. I had assumed it is the largest and most populous city in the county, but sadly it is neither. However we started to hit the first heavy traffic of the day around SR 92 so clearly it’s big and populous enough. The first thing I wrote down is there are no sidewalks at 42nd Avenue. Yumi Yogurt was a happy sight at 38th Avenue but it has no sidewalk either. I noted Hillsdale Shopping Center even though it’s on the other side of the street; an unforgivable mental lapse. However I was back on track with Ana Furniture which stands on the correct side of the street, across from the mall. Peninsula Station is a mixed-use development appealingly sandwiched between El Camino and Caltrain. This section has a kind of retro downtown feel with small sidewalks culminating with the highrise Tower Plaza building. There was a line out the door at Heidi’s Pies, people no doubt picking up orders for Turkey Day desserts. There was no rush though because Heidi’s never closes. Ever. Bridge Point Academy was the first school I had seen in a while, and The Beading Frenzy wins for the best business name of the day. My wife and my mom have both been into beading; the imagery in the name describes the ensuing mania perfectly. Scenic Central Park is bounded by 5th Avenuea sly homage to Manhattan geographyand is the gateway to downtown San Mateo. There’s a multi-level parking garage at 2nd Street which is great since downtown is so strollable. One notices that there are a lot of churches on El Camino in northern San Mateo. The Church of St. Matthew and St. Matthew’s Episcopal Day School occupy beautiful grounds near St. Matthews Avenue. Notably up to this point in San Mateo the street signs say “S El Camino Real” but here they switch to “N El Camino Real.” Indeed the address of the church is One South El Camino Real and this is where the numbered cross streets begin, starting with 1st Avenue and continuing into the forties as you proceed south. San Francisco and Santa Clara of course were Spanish Catholic missions that became cities and counties. San Mateo separates them but there was never a mission here, rather a satellite Franciscan outpost where San Mateo Creekwhence the region got its namecrossed the Royal Road. It’s notable then that here at the equator of the city, where north becomes south, on the El Camino virtual meridian there is no Catholic chapel but rather an Episcopal church. The Episcopal “big-C” Church as an institution was founded during the American Revolution to replace the Church of England in the newly independent nation. So in a sense the Episcopal Church of St. Matthew, built in 1865 on the site of the abandoned mission outpost, represents the region’s Americanness, a Yankee stake in the Ohlone-then-Spanish-then-Mexican ground, the footprint where Mateo got kicked out and Matthew was shoed in. Fittingly here at the crux of San Mateo’s history and culture is placed an El Camino bell marking the spot where a mission might have been. 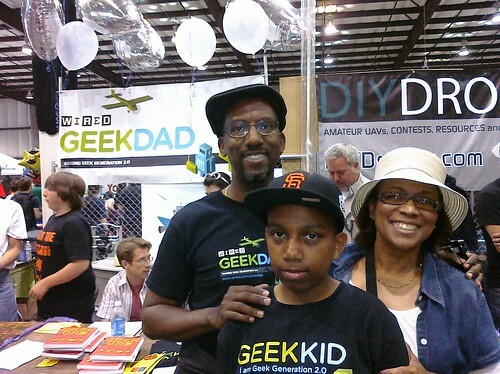 My parents live in San Mateo, a short stroll from El Camino. As it turned out, it took nearly three hours to get to their house from mine by bus, an amusing family factoid. I’m tempted to laugh at how impractical this mode of transportation seems, but in fact there was a passenger who got on the 522 with me in San Jose, transferred to the 390, and got off in San Mateo. People do it. As I was pondering this we entered Burlingame and were reminded by a familiar historical marker that Juan Bautista de Anza had been there 230 years prior. A public parking lot at Burlingame Avenue is convenient for shoppers and diners. Near Floribunda Avenue I spied a bell and not much further the wonderful onion domes of the Church of All Russian Saints. Russians have a long history in California, but that’s a topic for another time. Crossing Broadway downtown gave me a sense of déjà vu, having crossed Broadway in Redwood City already. There seems to be nothing but churches and apartments here, and I was struck how there were no pedestrians. After the businesses and apartment buildings faded we entered another zone of backside fences shielding single-family dwellings, similar to Atherton. The difference here though is the corps of venerable landmark eucalyptus trees. A bell at Rosedale and Peninsula Medical Center at Trousdale were my final Burlingame observations. In my life I’ve been to San Mateo too many times to count and to Burlingame maybe a dozen or two, but north of there San Mateo County is the wild unknown to me. Some of those cities I’ve been to a handful of times and others not at all to speak of, particularly not their El Camino profiles. It was actually kind of wonderful finally to experience these cities which are household names but which I had only visited in Google Maps excursions. Let me tell you, when you start a blog about a street, you wind up spending a lot of time in Google Maps. A lot. This in a nutshell is why I undertook this trip. There’s no substitute for being there. At Millbrae Avenue this bus turned off of El Camino for the first time to stop at the spectacular intermodal bus-BART-Caltrain Millbrae station. 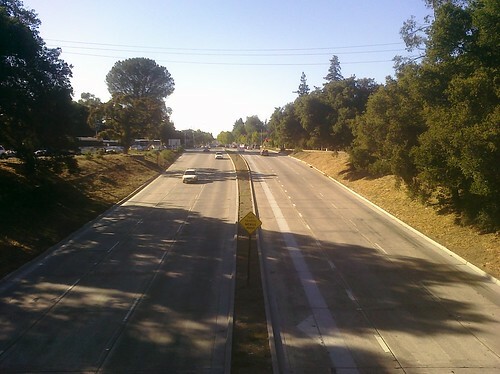 That’s when I realized how close El Camino is to US 101 here, probably the closest I came all day. By now it was after 3:15PM so school kids started boarding the bus, happy and chatty, ready for their long holiday weekend. Their presence brought a lively if slightly rowdy change of atmosphere. Back on El Camino, on the 1000 block there’s a bell. A little further a tree in front of the Mission revival Best Western El Rancho bears some kind of historical marker, but I don’t know what it signifies. San Bruno gets a standing ovation: their street signs sport their city seal which contains not one but two bells. Bravo! Now that’s some El Camino pride. In reality much of El Camino here is a commercial hodgepodge. It is happily broken up at “The Avenue” A.K.A. San Mateo Avenue, San Bruno’s deliberately-branded downtown shopping district. There is an actual bell here, presumably the model for the seal. I wonder though how those traditional downtown storefronts fare in the shadow of The Shops at Tanforan and San Bruno Towne Center. Malls kill commercial strips; that’s the perennial challenge for city planners. So is traffic, which again got heavy as we approached I-380. I don’t think I’ve ever been to Tanforan, and I was until now unaware that there’s a Hooters there, right on El Camino. Look for more in a future post. I will of course be looking for signs of improved morale and career advancement opportunities after their CEO’s epiphany on “Undercover Boss.” Plus I want to see the barstool trick. This is where I became aware of San Bruno Mountain rising before us. Ironically it is actually in South San Francisco, “The Industrial City.” The mountain really anchors and defines South City. There’s something else in South San Francisco: the headquarters of See’s Candies. I love candy and I love chocolate; I wonder if they give tours? After a while I noticed the road starting to ascend, and sure enough by the time we got to W. Orange Avenue we had gained a bit of altitude as we started to cross the northern tip of the Santa Cruz Mountains. I saw some big honking crows here. Kaiser Permanente Hospital looms large and Park Station condos and Archstone Apartments cozy up to the South San Francisco BART station, which again we had to turn off of El Camino to get to. The bus passed a Costco I had actually stumbled upon once years ago while looking for gas, and nearby there’s a bell. Treasure Island RV Park has a playful name. Here’s something to ponder. San Francisco and South San Francisco are in different counties, as are Palo Alto and East Palo Alto. Fascinating. Something else that’s fascinating is the city of Colma, “City of Souls.” To make a long story short, in 1900 it became illegal to be dead in San Francisco so Colma grew as a city of cemetaries to hold the San Francisco deceased. As you roll through Colma it’s literally cemetary after cemetary after cemetary. King of them all, at least from a bus on El Camino, is Cypress Lawn. Holy Sepulchre, Batman, is it ever gorgeous with manicured lawns, serene landscaping, and elegant structures. A nice place to visit. People do actually live in Colma, as evidenced by their landmark police station, and it has a homey village feel. 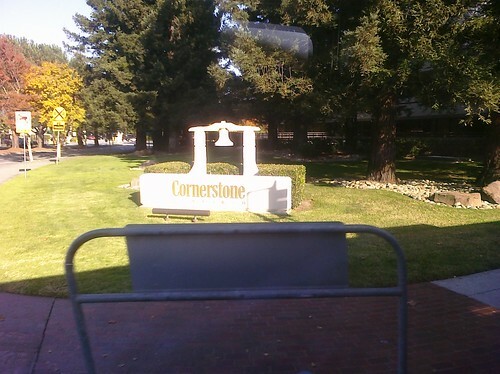 Colma does have a bell, right in front of Eternal Home. Bill Graham is buried there. Here though there are graves just feet away from El Camino which was somehow a bit shocking, but a frank reminder that not every final resting place is a country club. I made a note of pedestrians at the walkway to D street; it could be they were the first people I saw in town. Sidebar: the Colma Historical Association claims that “Colma” is an Ohlone word meaning “many springs” but I don’t buy it. I’m convinced it’s an acronym for “City Of” something, but I don’t know what yet. “Lawn-Mowed Acres”? “Little Motion Anywhere”? “Last Mortal Address”? What do you think? I noticed the street signs changed to some cool-looking blue ones with a bird logo and indeed the street name itself changed to Mission Street which means we were finally in Daly City. Mission Plaza at Citrus Avenue is a large retail center and there’s a bell in front. The War Memorial Community Center and John Daly Library complex are newly remodeled civic jewels and Landmark Plaza are condos in progress. My main impression was how similar Daly City is to San Francisco, dense and hilly. A spectacular view of Sutro Tower, not to mention some distinctly urban traffic, underscored this notion. Then at long last we reached the storied top-of-the-hill in Daly City, which I was very satisfied to see has a bell planted firmly at its peak in a place of honor. I’ll go out on a limb and claim without substantiation that this is the highest-altitude and westernmost bell in the Bay Area. The bus turned off Mission onto Hillside to head down to the Daly City BART station, the end of the line. It was about 4:00 PM. I gathered my things, disembarked, and prepared to board Muni for the final push into San Francisco. Next installment…Do You Know the Way to…? You are currently browsing the archives for the San Mateo category.